Simple Shoes has a new breakthrough line out called BIO.D - their first collection of biodegradable footwear whose soles biodegrade in a landfill environment in 20 years! If you think that's too long, consider this - EVA or rubber can take up to 1,000 years to biodegrade! From the BIO.D Collection comes Flippees for women and men. 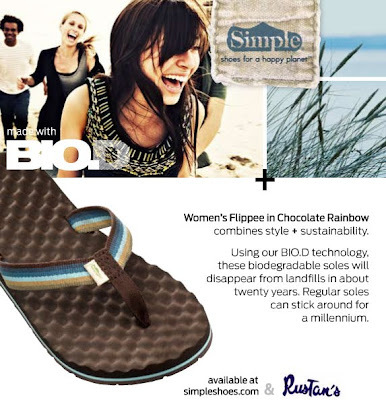 Simple’s Flippees are the first flipflops in the market to have biodegradable soles. This is because the sole is made of recycled and natural rubber with Eco-Pure additive to make the sole biodegrade in a landfill. Apart from that, it's got all these sustainable features any treehugging, granola crunching hippie would love! Simple® Shoes is based in Santa Barbara, Calif., and is committed to making shoes for a happy planet. Simple Shoes began in 1991, as a reaction to the over-hyped, over-marketed, and over-teched sneakers that were dominating the early 90’s. Since then, Simple has firmly planted its feet in making the most sustainable and stylish shoes and bags for everyone, everywhere. Simple is owned by Deckers Outdoor Corporation, and can be found on Facebook and Multiply. We got a pair at Santa Barbara last month and they are sweet!